Insulation – A Critical Element in Energy Saving. This is a general heat loss diagram that shows where houses lose heat and where cold drafts enter the home , all contributing to increased energy costs to maintain the comfortable living temperature. As you can see , our homes leak energy from all areas. 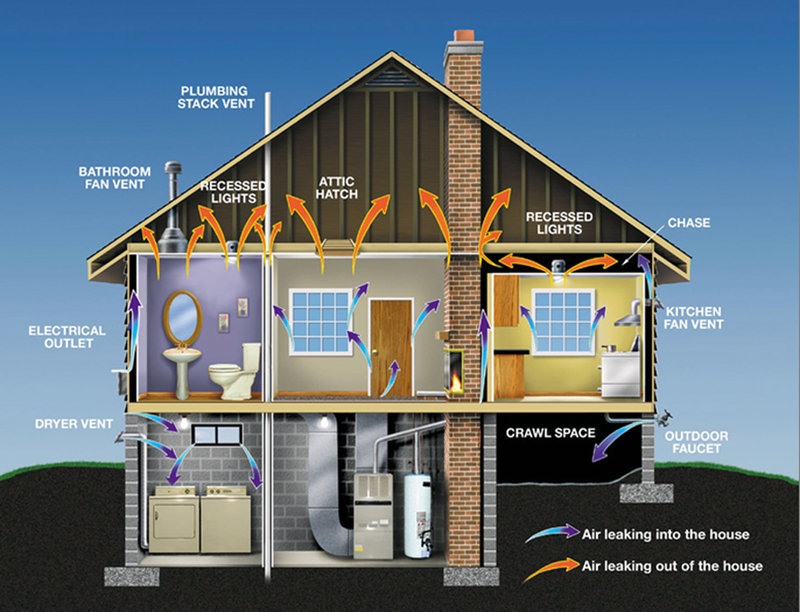 Between the roof,walls and floor, a home can lose around 70% of it’s temperature. While new building materials that are far more effective at insulating structures are being developed and provided for new housing,what about the old homes? Like the ones we own? In order for us to even consider energy efficient use of cooling and heating , we must look at the efficiency of our insulation first. For many of us , we focus on devices like geyser timers , geyser blankets , gas heaters , underfloor heating , airconditioning , heat pumps and solar systems to deliver heat to our home is winter , or ‘coolth’ in summer. Yet,with all of this expense to make the energy to keep us warm or cool , how much thought do we give to keeping that energy inside the home? In summer , we run air conditioners to keep the indoor temperature down so we are comfortable in the heat . In winter, we use gas heaters, oil heaters, bar heaters , diesel heaters and air conditioning or central heating to keep us warm. In all of this , we are willing to spend thousands of Rands (sometimes hundreds of thousands) to generate comfortable conditions inside the home – but how much of that investment is allocated to keeping that energy inside? Mostly , none. We go to great lengths to have energy efficient heating and cooling systems but we let most of that energy escape through the ceiling! 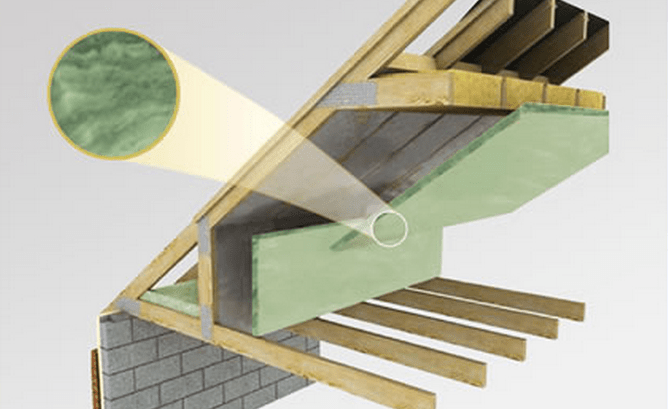 It is widely agreed that 30% – 40% of your heat generated is lost through the ceiling…so , if you think about that in reverse , you could save around 30%-40% of your energy costs by having efficient insulation. The truth is, we should be doing this the other way around. Ensure first that we have superb insulation, then go out and invest in energy efficient heating and cooling. Not only will this ensure that your home has minimal loss of heat , but also that cold air does not seep into the house as well. It is very important to get insulation installed by an accredited company. There are a number of aspects to this,the first of which is that you are getting proper safety tested product that would resist fire spread. The last thing you need is roof insulation that is highly flammable – not a good idea. Secondly , accredited companies have extensive experience and can assess the type of installation you need to be most effective in your home.Many of us have down lighters and the areas around them need to be properly prepared so that they do not overheat or short out. Also , you need to ensure that the insulation is correctly laid out in the ceiling and not just dumped willy-nilly. Lastly , if you have the job properly done , you will have recourse should you have any issues with the product or questions – and more importantly , you will see the benefits of the energy saving with the reduction in energy costs. Enlisting the services of a roofing specialist like Art Roofing Contractors will surely help you reduce costs of heating and cooling your home by proper insulation installation. Recycled and Environmentally Friendly Insulation. With the drive toward environmentally friendly products , insulation is no different. Many companies have developed innovative materials made from recycled PET ( 2 L Coke bottles) and other materials that not only provide excellent insulation , but are also full recyclable. This is a very important part of Saving Energy as not only do we want to reduce our carbon footprint , but also reduce any potentially hazardous pollution of the environment. In South Africa, we have companies that have invested extensively in finding both effective and eco-friendly insulation solutions.